A father’s murder. A mother’s secrets. Can he protect his family from their deadly past. This first book in the John Lawrence series is a gripping crime thriller. Full of suspense and gut-wrenching twists, Left Luggage shines a light into the dark edges of Sydney. Why am I giving my book away? 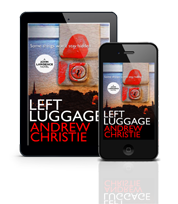 Because if you enjoy crime thrillers, I think you will enjoy Left Luggage. And if you do, you might like to read some of my other books. I will send you an email with a link to download the e-book in your preferred format. I won’t spam you and you can unsubscribe at any time, it’s easy. And I won’t be offended.